Now to make it perfectly clear, if you bake your steak it doesn’t taste the same. However different doesn’t mean bad! You won’t need a steak knife for these steaks, as they are cooked slower they are less tough and more melt-in-the-mouth. They taste more like roast beef. 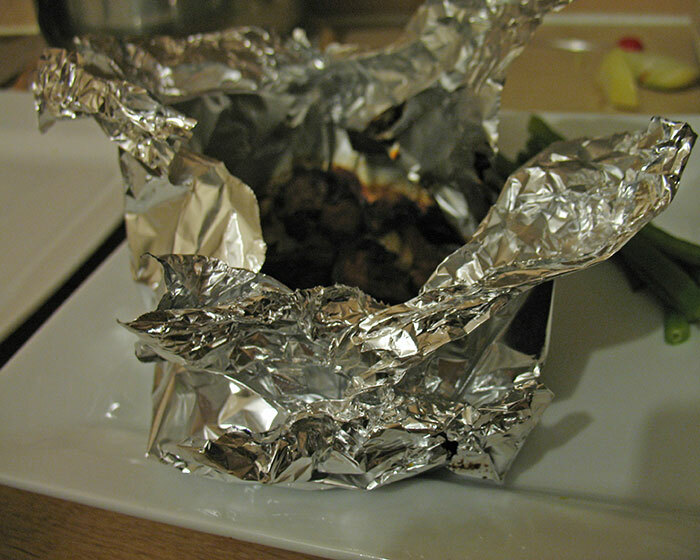 Prepare the tin foil by cutting sections big enough to wrap around each steak. Pre-heat the oven to 190 oC (375 oF). In a frying pan brown the steaks for a minute each side on a high heat, then add some water, mustard and the Worcester sauce. 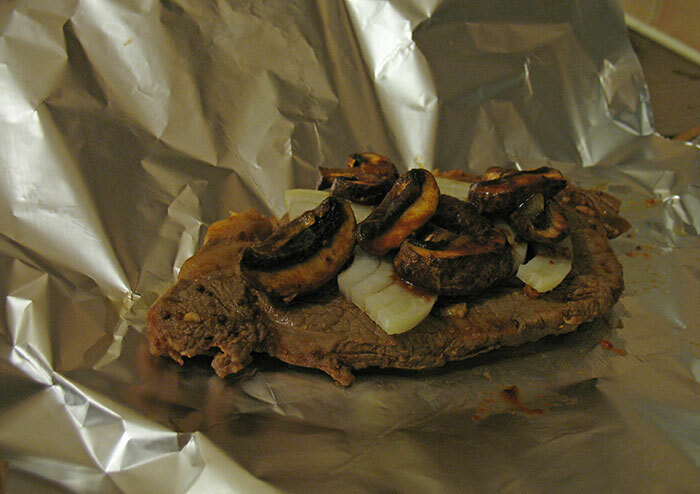 Remove the steaks from the frying pan and place each on a sheet of tin foil. Add the mushrooms to the liquid and leave to reduce, until thick. In the mean time top each steak with some sliced onion. 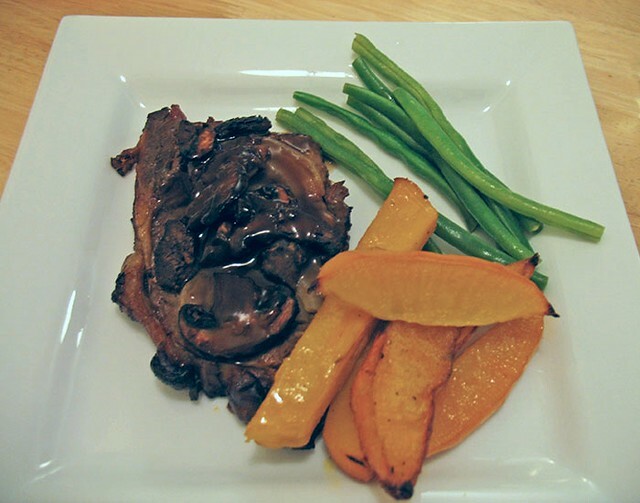 Once the sauce has reduced top each steak with some of the liquid and mushrooms. 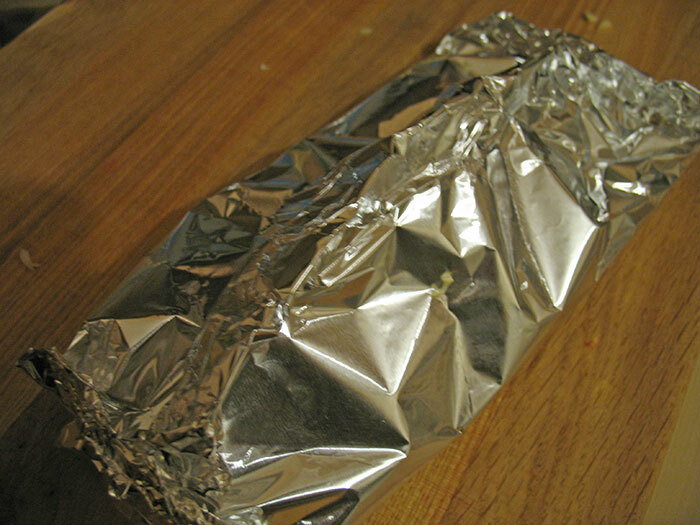 Wrap each steak in the tin foil, using double folds at the edges to ensure the liquid can’t escape. 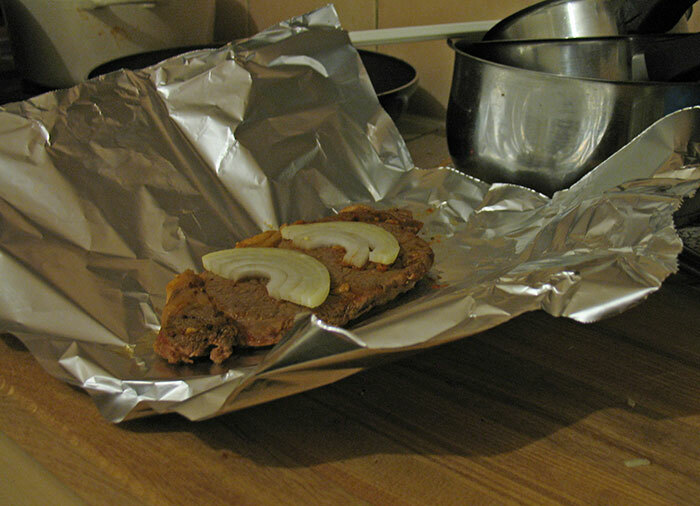 Place on a baking tray and cook in the oven for at least 1 hour. They are cooked if you can easily cut through the steaks. To serve I made turnip chips and added a side of green beans. Somehow fried Steaks makes me think of a special Saturday night dinner, a romantic evening in, this steak is definitely for Sundays. It’s relaxing, easy, comfort food.